Northern Sweden’s next big space project RIT 2021 was inaugurated at the event Space Innovation Forum during the week. The project is run by Luleå University of Technology with the aim of promoting pioneering research and innovations for the space industry in northern Sweden. – As Sweden’s leading space university, it is important to be an engine for regional growth, and therefore we cooperate with a number of different players outside the university, not least our Swedish space companies, said Jonas Ekman, head of the dept of SRT and initiator of the RIT projects. – With RIT2021 we want to make space available so that more players can take the step into the industry and together develop the region and the future space industry, said Johanna Bergström-Roos, project manager for RIT 2021. 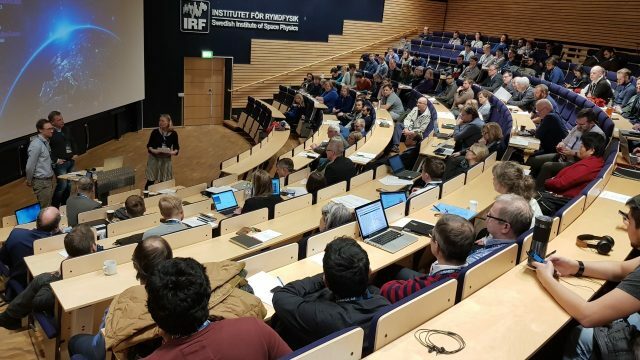 Within the framework of the project, Luleå University of Technology will work with the Institute for Space Physics (IRF) and SSC Esrange to create a test bed in Kiruna for advanced space technology testing of new systems and components on satellites that will be sent out in space. This work package is led by Olle Norberg, former head of Esrange and Director General of the Space Agency, who is now back in the region to help develop the space industry further. In total, RIT2021 has a budget of SEK 55 million until 2021. At the same time, the new space company PASQ spoke at the “Space Innovation Forum” about its upcoming activities that will be started in Kiruna shortly. Their business concept is about offering services within testing and qualification of equipment used on spacecraft such as satellites. – Today there is no simple solution for this, so it is difficult for new private companies to manage it on their own. Space technical expertise is required and a number of tests have to be performed, making it all complicated, time consuming and often very costly. With our total solution, more companies can take the step into the space industry. It feels incredibly good to start up in Kiruna and start our journey. Here is experience, expertise and the right infrastructure for our business, said Emil Vinterhav, CEO of PASQ. Another new venture that was presented during the event is “Space Innovation Summer” where students are offered to stay in Kiruna during the summer and work with space innovations as a summer job. – We have similar initiatives in other areas and they work excellently to increase the region’s attractiveness while the students have to work with something that is really relevant to their education, said Emil Svanberg, Innovation Manager at LTU Business AB. Luleå University of Technology has for many years invested heavily in developing the space region with, among other things, research in cooperation with the space industry. The event “Space Innovation Forum” is another important activity and on site this day there were therefore three of Sweden’s foremost space companies: SSC, GKN Aerospace and OHB Sweden. The start-up of the RIT 2021 project ensures continued development of a well-functioning ecosystem around the space industry with the aim of strengthening upper Norrland as Sweden’s space region.